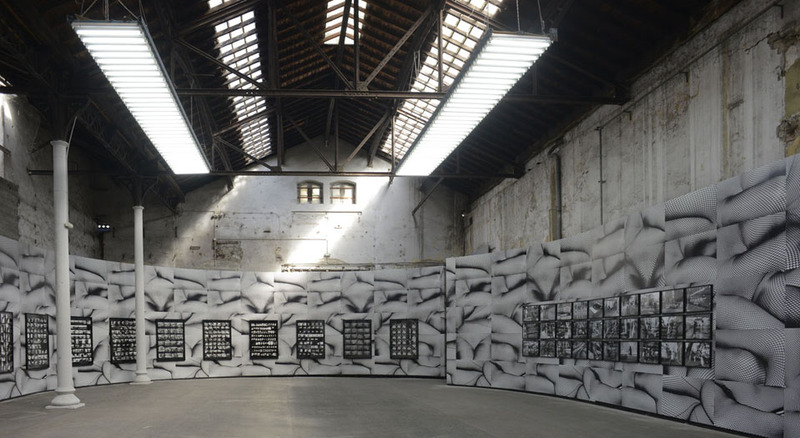 Produced by the Polka gallery in collaboration with the Association du Méjan – Actes Sud, LABYRINTH + MONOCHROME is an installation designed by Daido Moriyama specially for the Magasin électrique in Arles. Recently, the Tate Modern (London), LACMA (Los Angeles) and the National Museum of Art (Osaka) showed large retrospectives of his work which began in 1960. Here, Daido Moriyama, born in Japan in 1938, gathers three of his latest creations – Labyrinth, Monochrome and Mesh – that sum up at once four decades of reflection on photography. In 2012, Daido Moriyama revisited 10,000 of his own images to create Labyrinth. Far from merely disclosing contact sheets – a making-of often fantasized by the public – the artist assembles on one sheet negatives from different epochs. In this maze of images where places and years constantly overlap, Daido Moriyama affirms that what links photographs is not their time and location but their contents, their compositions and the interplay of meanings. Such flood of images is also the creative approach behind Monochrome (Black and White in Japanese). These photographs, taken between 2008 and 2012 in Tokyo, do not constitute a portrait of the megalopolis and its inhabitants. They are a flow which reveals the state of mind of Daido Moriyama, a street photographer always on the look-out, when in action in his own city. Daido Moriyama, who often shoots "blind" adopts the attitude of a wanderer prowling for faces, forms and strange scenes much like a stray dog – an animal to which he often compares himself – would. 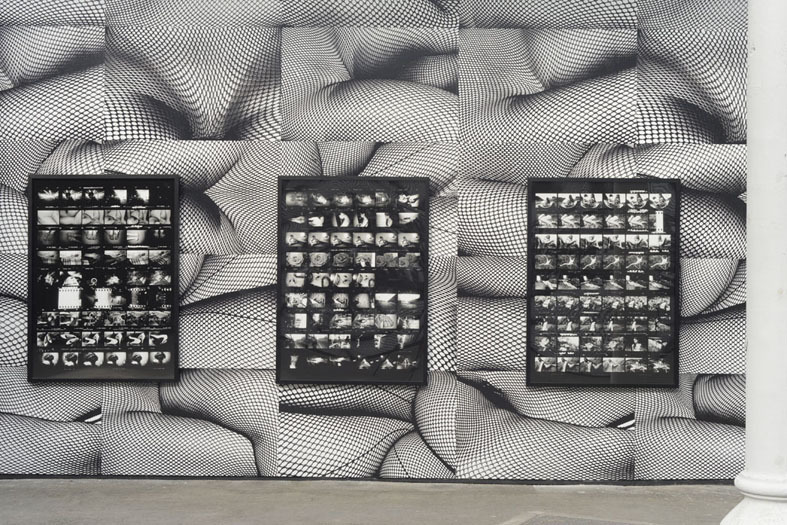 ”Labyrinth“ and ”Monochrome“ are supported by Mesh,a mural mosaic which reminds us that Daido Moriyama, as early as the seventies, sought to redefine exhibition formats to activate his pieces through their contact with the public. Author of over two hundred books, Daido Moriyama has always been concerned with adapting the appearance of his images according to their sizes or supports, whether it be books, prints, silkscreens, or in this instance, wallpaper. In 1986, he produced a series of photographs of mesh tights which he published in Lettre à St. Lou – Saint-Loup-de-Varennes being the French village where Nicéphore Niépce invented photography. Subtitled How to Create a Beautiful Picture, this series of kinetic images forms the graphic part of the fictive letter to the father of photography. LABYRINTH + MONOCHROME demonstrates that photography is a practice. For Daido Moriyama, it is an energetic language which finds its richness in the profusion of images and exists only to be shared with the public. Simultaneously, the Polka gallery presents, in Paris, View from the Laboratory [Platinum prints], Daido Moriyama’s latest series in the traces of Nicéphore Niépce from Saint-Loup-de-Varennes and Tokyo, until August 3rd.